One of the first employees hired after Fire Farm's move from California to Iowa, Lois Ott is now our first retiree. 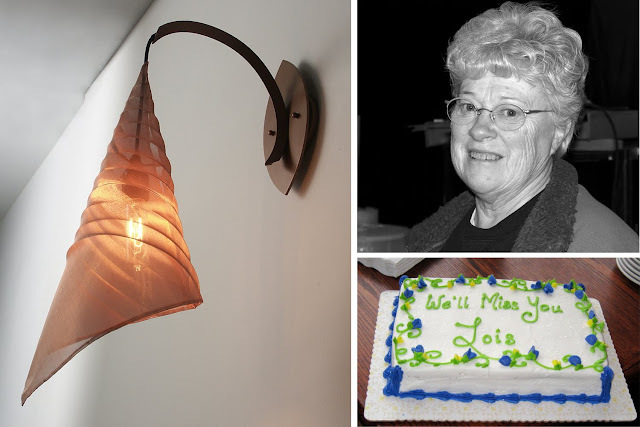 After eight years in the Production Department, Lois will no longer be found fashioning beautiful mesh shades for our fixtures. Being an expert mesh-folder, Lois came up with a folding design all her own, resulting in what has been named the "Loie" lamp (pictured above), which will become an addition to our stock product line. Thanks, Lois, for all of your dedication and hard work -- we'll miss you!